Most of you are probably aware of the old mantra (sticking with the yoga theme) in real estate; location, location, location. Well, if you believe the mantra, have I got a deal for you! 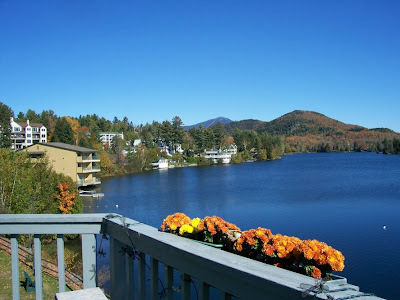 A landmark property at 1 Main Street in the Village of Lake Placid is currently offered for sale at a great value. This lake front commercial building is on a corner of Main Street in this resort town that receives very high foot traffic. Adjacent to a Village park, the building has been owned for more than 30 years by the same Lake Placid family who founded the children's store currently located on street level. The building originally housed the Lake Placid leather repair shop in the early days of the Village, circa 1935. It is an awesome location with Mirror Lake waterfront footage leased to a boat rental business in the summer. There is a restaurant downstairs, the aforementioned world-renowned children's store on the main retail level and two apartments upstairs. Some of you may remember the famous, "Artist's Cafe" which used to be located downstairs on the lake. Or perhaps you'll recall the cool kids store, Far Mors Kids. There is a new popular restaurant in the lower level now called "Player's Sports Bar" which still features lake side dining. This property is a great investment since the new pricing enables positive cash flow. Please contact me if you are interested in hearing more about this opportunity. Today's featured photo is a view from the upstairs apartment balcony on a lovely late summer day last year. How's that for a backyard?